I’ve gathered together some great Labor Day Sales for clothing, children’s clothing, and gifts. Plus, several of them are giving back to the Hurricane victims so be sure to browse the entire list! Nordstrom – up to 40% off sale! Highlights: Tory Burch riding boots are 33% off, Nike Free Runs are 25% off, Hunter boots are 25% off. This super popular long tunic is 33% off and under $30. 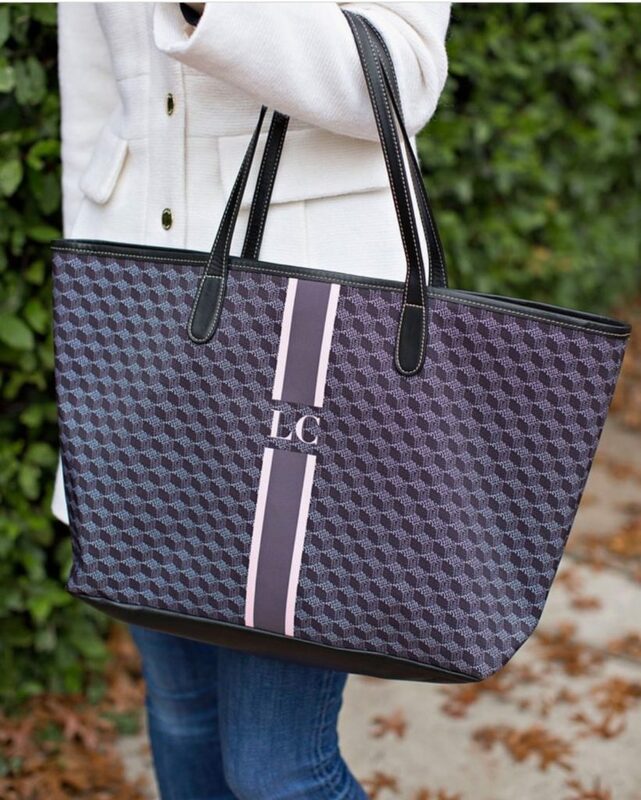 *Barrington Gifts – Get your fall monogram tote (shown above)! Or get one for a gift! Use code TOGETHER to get 10% off and Barrington will donate 10% to local charities assisting with disaster relief. J. Crew – 30% off entire purchase with code YESPLEASE. Ann Taylor – 50% off new styles + 50% off sale. LOFT – 30% off new styles. Really like this patterned shirt dress. Neiman Marcus – up to 65% off sale. *Lilly Pulitzer – All proceeds from this special edition Texas tee will go to the American Red Cross and 15% off sales made on September 2nd (in store and online) will go to the Red Cross. Liz and Honey – 50% off everything sitewide with code LABORDAY50. Beautycounter – Receive a full size facial oil when you spend $150 through Monday. I use #3! The Beaufort Bonnet Company – Free shipping! They just released their resort line for boys and girls – darling swimsuits and coverups! Also don’t miss their Christmas pajamas. Use code hoptoit. Hanna Andersson – 20% off baby and toddler! Have you seen their new footed pajamas and gowns for babies? So sweet! The Tot – Take an extra 40% off sale items with code LABORDAY40. Love these sweet leather baby shoes and this Dr. Brown’s Bottle sterilizer. And this outfit would be darling on a little boy for holiday. See feeding gear on sale here. Pottery Barn Kids – 30% off + Free shipping! Think Halloween costumes and baby gifts! Use code SAVEMORE. Minted – 15% off baby announcements and kids birthday party invitations with code LABORDAY17 through Tuesday. Eyelet & Ivy – Love their pima knits. Great for play clothes and don’t miss their lounge wear. Free Shipping through Labor Day! No code needed. *Frances Rose – Take 10% off with code LOVEHOUSTON. They will donate 20% of the proceeds to their team in Houston affected by the sales. Kate & LIbby – 25% off order through Monday. Use code backtoschool25. Minnow Swim – the girls’ bathing suits you’ve been seeing all over Instagram this summer are 20% off with code SUMMERFOREVER. Buy ahead for next year. *Wisteria – 25% off sitewide! I get so many gifts and home decor items from this beautiful store. Also if you are in Dallas they are collecting cleaning supplies today (September 1) for Houston victims at their Outlet in Farmers Branch. 13780 Benchmark Drive. Etsy – Shop in their first ever Labor Day Sale! My favorite little wooden peg dolls are part of this sale including custom dolls (great gift!). *Joy Creative Shop – $5 from this Texas themed stationery will go towards purchasing supplies for Houston families in shelters around Dallas. And they are on sale for Labor Day as are several things in her store! *Love Lucy -Their Playroom collection labels are part of Etsy’s Labor Day Sale! I bought these years ago and they are still going strong in our playroom closet. Special edition gift tags where 100% off proceeds go to Harvey victims. Write the Word Journals – These popular Scripture journals always sell out so fast. Stock up with the entire Season collection and you will get 10% off at checkout. Star Wars – Get a $10 Target Gift Card when you spend $50 on Star Wars products. *Sprinkles – On Saturday, September 2nd Sprinkles is donating 100% of proceeds from Texas Strong Red Velvet Cupcakes to the Houston Food Bank. * Emily Ley – Donate $20 and get an adorable print! *** I am sharing more companies donating proceeds to Hurricane victims on DoSayGive’s Facebook page.